The Denisovans are a Middle Pleistocene human group of which we only know four modest remains, but which have preserved enough genetic material to allow the identification of a new human species (with pending definition), different from the other two species (at least) with which it coexisted and hybridized: Homo neanderthalensis and Homo sapiens. The remains identified as Denisovans are a finger phalanx of a female juvenile individual (Denisova 3), two molars (Denisova 4 and Denisova 8, both male adults), and a deciduous molar of a female child (Denisova 2). 1) The two Xuchang skulls, dated to 105-125 ka, found in Lingjing, east of China, about 4000 km from Denisova cave. Initially considered Homo erectus. 2) The Xujiayao teeth, which are large and complex, and considered to belong to a transitional population between Homo erectus and Homo sapiens, or alternatively Homo sapiens if taking into account the post Acheulean lithic tools and the fauna of the site. They combine primitive and modern features, similar to those in Neandertals. In 2017 they were dated to 260-370 ka, a range that further complicates their assignment to a species. Very low and elongated skull. However, the maximum cranial breadth is on the superior temporal region (in Homo erectus it is on the inferior region). Thick bones, especially the temporal, parietal and occipital. Sagittal development along the skull. Cranial capacity of 1120 cc. Gracile zygomatics, with insertion on the alveolar region similar to that in Homo sapiens. Quadrangular orbits, with smooth and rounded margins. Broad nasal region, some Neandertal-like. 4) The Harbin skull, which remains unpublished to date, except a few photographs in the Chinese press. Incredibly, it remained hidden in private hands from its discovery in 1933 until September 2018. It seems very similar to Dali on the face, supraorbital tori, frontal and orbits. In the press note it was defined as Homo heidelbergensis and assigned an estimated age of between 200-400 ka. 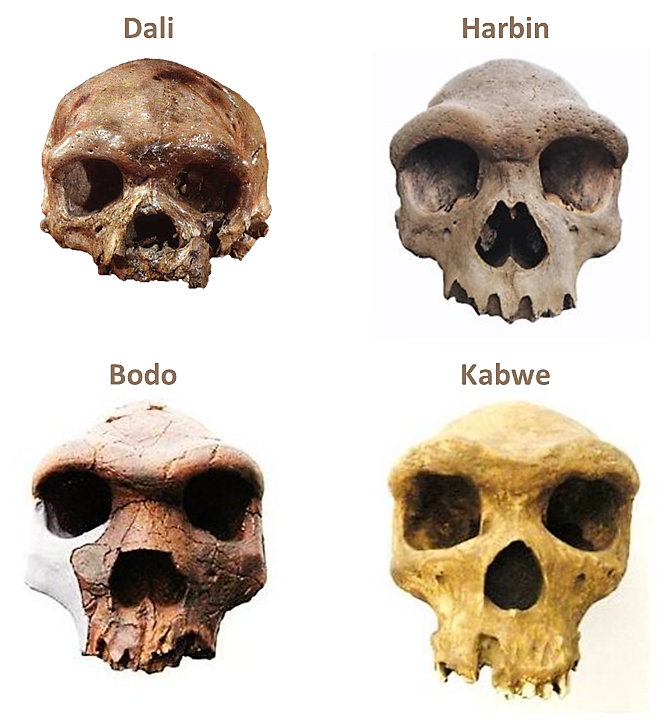 In the absence of a formal definition for the species Homo heidelbergensis, it is in any case difficult that a same biological entity can represent the materials of Mauer, Petralona, Bodo, Kabwe… and also Dali, Harbin and other Chinese specimens. What does seem clear is that during the Middle Pleistocene there were different waves in Asia (and Europe) that genetically mixed the existing human groups with new ones. The comparison of the Denisovan genetic material with that of other contemporary Asian fossils (which will end to happen), will help to understand the complex evolutionary relationships between the human groups in Eurasia and also with their African contemporaries. More information: A new Denisovan! Esta entrada fue publicada en Fósiles y etiquetada Asia, Bodo, China, Dali, Denisovan, Denisovanos, Harbin, Homo erectus, Homo heidelbergensis, Kabwe, Middle Pleistocene, Pleistoceno Medio. Guarda el enlace permanente.